This work was supported by National Science Foundation award #0831948. Hungarian Falls is found on Dover Creek, a small stream which is nearly dry in summer, but which follows an impressive gorge to the ESE toward Tamarack City. The site is managed by Michigan DNR (TF677) a forest management site, and by Keweenaw Land Trust. The gorge under Dover Creek is about 200 feet deep and 200 feet wide in places and extends steep walls about 0.5 miles toward Tamarack City below the falls. 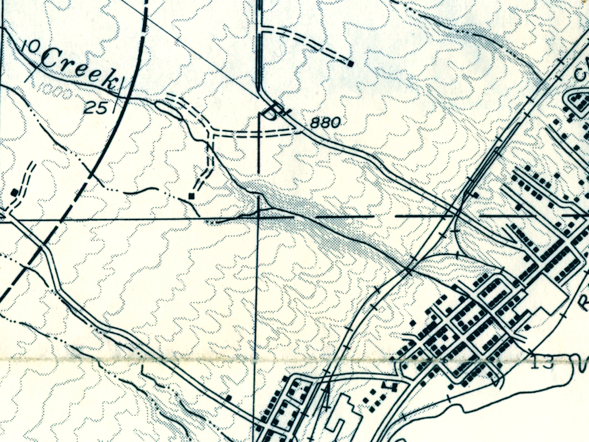 There are several falls, all located downstream from the Keweenaw Fault. Walking trail access to the river allows approach to the fault itself and many places where geologic features of the Jacobsville Sandstone may be observed. Dover Creek is one of several small rivers which have cut gorges downstream from the Keweenaw Fault and flowing toward the Traprock River or Torch Lake. 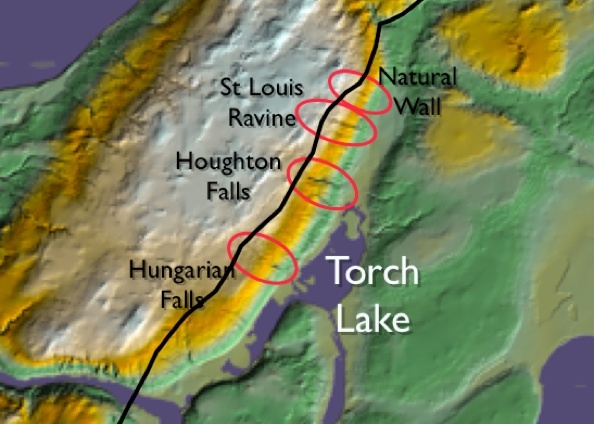 The Black Line is the Keweenaw Fault.